One of the most important sources of year-to-year climate variation in the Southwest is the El Niño phenomenon of the tropical Pacific Ocean. El Niño is a natural but largely unpredictable condition that results from complex interplay among clouds and storms, regional winds, oceanic temperatures, and ocean currents along the equatorial Pacific. Figure 1. Schematic diagram of normal and El Niño conditions in the Pacific Ocean. From NOAA El Niño website. ponding up warm water in the western Pacific. In the eastern Pacific, the trade winds pull up cold, deep, nutrient-rich waters along the equator from the Ecuadorian coast to the central Pacific. The warmth of the western Pacific results in a particularly vigorous hydrologic cycle there with towering cumulus clouds and tropical storms that "radiate" atmospheric waves and disturbances across vast regions of the globe. Heat and moisture lofted into the upper atmosphere by the clouds and storms are distributed by high-altitude winds across vast regions of the globe. During an El Niño, this situation is disrupted and the trade winds weaken, thus reducing the upwelling of cool waters in the eastern Pacific and allowing the pool of warm water in the west to drift eastward toward South America. As the central and eastern Pacific warms, atmospheric pressure gradients along the equator weaken, and the trade winds diminish even more. These changes in sea-level pressure of the atmosphere are characteristic of the strongest El Niño and were identified as the "Southern Oscillation" of the global atmosphere by Sir Gilbert Walker in the early decades of this century. A chicken-and-egg relation exists between the changes in ocean temperatures and changes in winds (and atmospheric pressure gradients); the two sets of changes reinforce and drive each other but neither is clearly or universally "the" initiator of El Niño. Ocean temperatures and surface winds interact to form the complex process, El Niño-Southern Oscillation (ENSO). The interactions can be set off by subtle changes in one or the other, by buffeting from other parts of the tropics, or from regions beyond the tropics. Such a complex interplay and its uncertain (and variable) origins are the primary limitations on our ability to predict El Niño. As the waters of the central and eastern Pacific warm, the powerful tropical Pacific storms begin to form farther east than usual (Fig. 1). As the distribution of storms spreads east along the equator, their influence on global weather systems also changes. Most notably, for our purposes, the jet stream over the North Pacific Ocean is invigorated and pulled farther south than normal, where it collects moisture and storms and carries them to the southwestern United States and northern Mexico. During an El Niño, the trade winds are too weak to cause upwelling of nutrient-rich waters off the coasts of Ecuador and Peru. Generations of South American fisherman thus have recognized these conditions by the disappearance of their standard catch, commonly during December and January, every three to seven years. Because of the near coincidence in timing between these conditions and Christmas, the fishing communities have called the phenomenon "El Niño", for the Christ child. The geologic record suggests that El Niño conditions have been a part of earth's climate for at least several thousand years. An El Niño event usually lasts for several seasons, and, along with its other effects, represents an interruption of the "normal" seasonal cycle of the tropical climate. After a few seasons, and usually during spring time (in the Northern Hemisphere), the seasonal cycle reasserts itself and the tropical ocean cools back to the normal east-to-west sea-surface temperature gradients. Sometimes the warm El Niño events give way to unusually cold sea-surface temperatures and unusually strong trade winds, a condition now called La Niña. On other occasions, La Niñas may begin on their own, without an immediately preceding El Niño. The effects of the El Niño and La Niña on global climate are, in part, mirror images of each other. For example, drought is a common occurrence in the southwestern United States during La Niña, in contrast to the wet years associated with El Niño. The warming associated with the most recent El Niños, however, has been unusually persistent. The most recent El Niño waxed and waned for over four years in the early to mid 1990s. Some scientists raise the possibility that heating of the atmosphere by global warming could increase the frequency and duration of El Niño events, creating longer periods of flooding and drought (Trenberth and Hoar, 1996). Such a possibility may undergo initial scrutiny in the near future, because recent observations of wind, water temperature, and fish in the Pacific Ocean suggest the onset of the next El Niño. El Niño as a Window to Future Climate? Many influences in the global climate system, other than El Niño, determine the climate, hydrology, and landscape of the Southwest. Nevertheless, the transient El Niño is certainly the best studied example of a global climate change, having coherent influences (varying rather smoothly from place to place) that arise from recognized physical origins. El Niño is also of a scale, both spatially and in terms of the magnitude of temperature deviations, that is comparable to much of the greenhouse change projected in climate-model experiments. The ways in which water and land resources are managed and maintained in the presence of El Niño-like variability, which has time scales of only several seasons to several years, provide snapshots of the kinds of responses that might be necessary in a climate-changed world. Qualitatively, the primary difference is that an El Niño is "always" interrupted, whereas any new state or mode of global climate would result in dominant conditions and climatic variability unlike those of today. The effects of El Niño are widespread, and any El Niño event may touch the lives of more than a billion people around the globe. The impacts can be devastating, as illustrated by some of the effects of the unusually strong El Niño of 1982-83: Drought (sometimes with associated wildfires) in many nations of the western and southwestern Pacific Rim, southern Africa, southern India and Sri Lanka, Spain, Portugal, northern Africa, and parts of South and Central America; severe cyclones that damaged island communities in the Pacific; flooding over wide areas of South America, in western Europe, as well as in the Gulf Coastal states and some Caribbean islands; and severe storms in the western and northeastern United States (Glantz, 1996). It is not surprising that destructive weather can affect the Southwest during El Niño years, because much of western North America lies in the path of storms that can be carried by the atmospheric circulation patterns spawned by El Niño. Below we examine some effects of El Niño events on streamflow, on lake-level change of Great Salt Lake, and on landslide potential. In general, El Niño events increase precipitation and landslide activity in southern California and the Southwest. A recent example is the 1992-93 winter in the Los Angeles area and northern Arizona. On the other hand, El Niño may bring drought to the northern Rocky Mountains, part of which lie within the Upper Colorado River Basin. El Niños vary widely from event to event, with different sequences and distributions of sea-surface warming and wind-pattern changes. These variations result in large differences in the weather of the Southwest depending on the particular pattern, strength, and timing of El Niño influences on storm tracks. Weather typically differs markedly from north to south during an El Niño event (wet in south, dry in north) but also usually varies greatly within one region from event to event. Areas near the boundaries between regions that receive more rain during El Niño and regions that receive less are especially prone to event-to-event differences. As an example, San Francisco lies near the transition between wet and dry El Niño zones, and thus the El Niño effects can be quite variable. Las Niñas also have differing influences from episode to episode. As a result, the San Francisco area may receive heavy rains (or drought) during either El Niño or La Niña. Glantz, Michael, 1995, Currents of Change: El Niño's Impact on Climate and Society: Cambridge University Press, 194 p.
Diaz, H.F., and Markgraf, Vera, 1992, El Niño. Historical and Paleoclimatic Aspects of the Southern Oscillation: Cambridge University Press, 476 p.
Trenberth, K.E., and Hoar, T.J., 1996, The 1990-1995 El Niño-Southern Oscillation event: Longest on record: Geophysical Research Letters, v. 23, p. 57-60. El Niño and Climate Prediction; NOAA. Children of the Tropics: El Niño and La Niña. National Center for Atmospheric Research. The Role of Climate in Estuarine Variability; USGS. El Niño; NASA and the Smithsonian Institution. El Niño and U.S. Agriculture; USDA. Bibliography on the effects of El Niño on the United States. ENSO impacts on North America. Abstracted from the paper El Niño/Southern Oscillation and Streamflow in the Western United States, by Daniel R. Cayan and Robert H. Webb, in Diaz, H.F., and Markgraf, Vera, 1992, El Niño. Historical and Paleoclimatic Aspects of the Southern Oscillation: Cambridge University Press, p. 29-68. Daniel Cayan is an oceanographer with the USGS and is located in the Climate Research Division of the Scripps Institution of Oceanography. Robert Webb is a hydrologist with the USGS in Tucson, AZ. The Southwest experiences enhanced streamflow and seasonal snow water content during the mature winter phase of El Niño, and it experiences diminished streamflow and snow water content during La Niña phases (Fig. 2). The opposite is found for the northwestern US. Figure 2. Snow-water content and mean streamflow for the water year for the Salt River, Arizona. El Niño and La Niña years are denoted by solid circles and open diamonds, respectively. (Modified from Cayan and Webb, 1992). Figure 3. A composite 700-mb height anomaly (m) and gridded precipitation anomaly for day -2 (two days before) and day 0 of heavy (10 mm) daily precipitation events at Salt River, Arizona, during February/March/April (FMA). El Niño events are above and La Niña events below. The 700-mb heights are from 12 00 GMT gridded analysis from days entering the composite. Areas of composite anomalies significant at the 95-percent confidence level are indicated by shading. Shading of precipitation indicates regions with equal or greater than 5, 10, and 15 mm. (Modified from Cayan and Webb, 1992). These differences are illustrated by comparison of daily precipitation rates, from 1900 to 1990, in the Salt River basin, Arizona, and Yellowstone River basin, Montana, representing southwestern and northwestern El Niño influences, respectively. Both the frequency and amount of precipitation differs significantly and in opposite ways during El Niños and La Niña. At Salt River, El Niño years are characterized by an increase in amount and especially the frequency of early winter and late winter/spring precipitation, whereas La Niña years are characterized by corresponding decreases in precipitation during these season (Fig. 3). At Yellowstone River, on the other hand, there is a decrease in the amount of early winter daily precipitation during El Niño and an increase during La Niña. Differences between El Niño effects in the northwest and southwest arise because of the way that El Niño events alter the atmospheric-circulation patterns that steer storms towards, or away from, various regions. El Niños involve eastward shifts in the distributions of tropical storminess over the equatorial Pacific and weakening of the tropical trade winds. These shifts change the patterns of high- and low-pressure and winds over the North Pacific and North America, invigorate the jet stream, and draw it farther south over the North Pacific. During El Niño winters, storm tracks that bring precipitation to the western United States are embedded in strong westerlies that occupy broad swaths of the subtropical and central North Pacific basin. In contrast, La Niña storms tend to be parts of more isolated weather systems, cut off from much of the North Pacific by high-pressure areas in the Gulf of Alaska. Flooding in the Southwest--El Niño or not? An evaluation of flood histories in the Southwest yields a more complicated picture than is obtained by looking strictly at the influence of El Niño on precipitation. The sources and timing of streamflow generation in a given river colors the way that an El Niño event may influence its streamflow. In Arizona, for example, the largest floods this century have occurred during El Niño (Table 1; Fig. 4). Floods in Arizona are generally fed by either winter frontal storms or by intense summer thunderstorms (and even some tropical storms that find their way up from the west coast of Mexico). These floods depend on the intensity of a few storms rather than (in most cases) the overall total annual precipitation. In other areas of the Southwest, however, where snowmelt is the primary source for streamflow, a few intense storms may not cause flooding. In such regions, it is not uncommon to find that floods arise in years other than El Niño, when heavy snowpacks are melted suddenly by rain storms or by the sudden onset of spring-summer temperatures. The various conditions that can lead to flooding are affected by El Niño (and La Niña) in different ways from region to region and from event to event. In broad terms, El Niños increase the likelihood and severity of winter storms in the Southwest. Furthermore, El Niño conditions increase the chance of receiving tropical storms from the eastern Pacific. 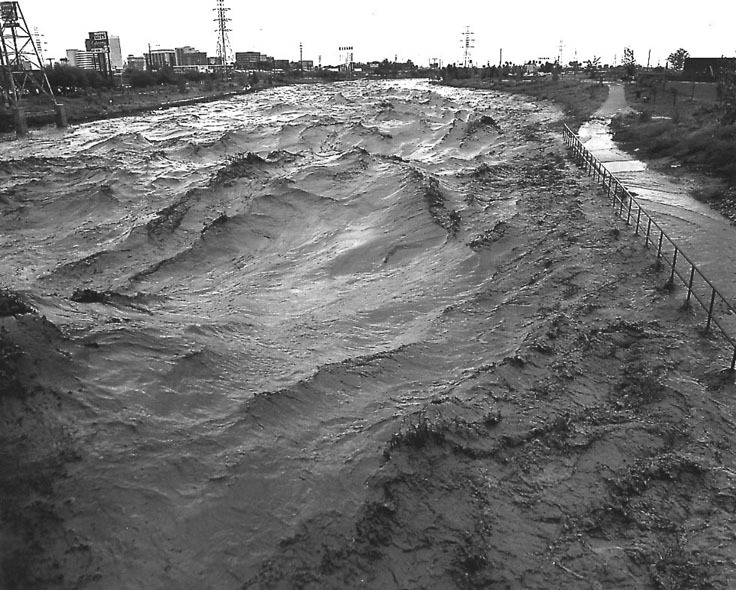 If a given river responds to these types of storms, which typically have a rapid flood response, El Niño conditions yield the largest floods. A, Santa Cruz River from St. Mary's Bridge, Tucson; October 2, about 10 a.m.
B, Interstate 19 crossing of the Santa Cruz River, south of Tucson, October 3. View is downstream and shows the missing span on the north-bound bridge. C, Bank erosion along Rillito Creek at Tucson, AZ, October 2. View shows the collapse of the bank at a townhouse development on Country Club Road. Direction of flow is from right to left. D, Flood-plain damage along the San Francisco River (against the cliff) at Clifton, AZ, October 8. View is downstream. Even where spectacular floods have been associated with past El Niños, the onset of an El Niño does not guarantee flooding and not all floods have occurred during El Niño years. Instead, El Niños affect the odds of flooding in a given river and given winter so that only over the course of many El Niño episodes can conclusions be drawn. 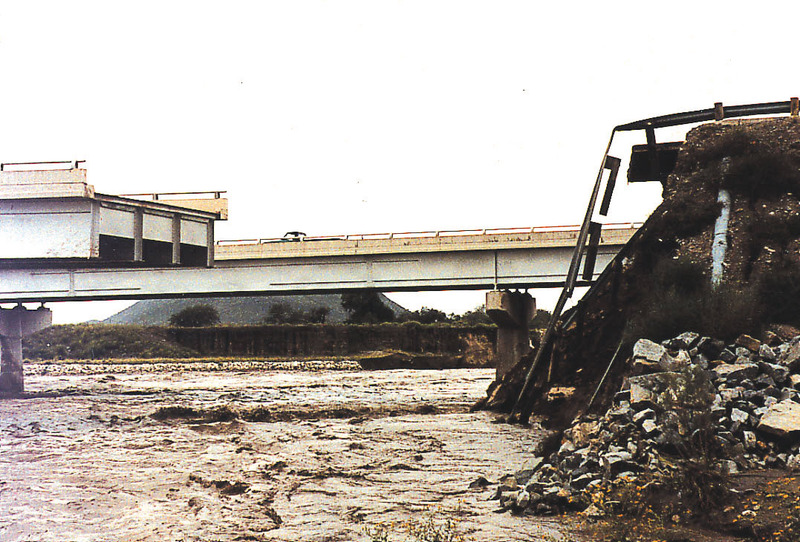 For example, floods have occurred more often in many rivers of Arizona during El Niños than in other years. Indeed, if only El Niño years were considered in estimating the size of a 100-year flood of the Santa Cruz River at Tucson, Arizona, then the best estimate (ca. 1992) would have been about 1,200 cubic meters per second. If El Niño years were dropped from the analysis, the best estimate would be only 600 cubic meters per second. In contrast, the Salt River, not so far away, has a 100-year El Niño flood of about 5000 cubic meters per second but in other years a 100-year flood of almost 9,000 cubic meters per second (Figs. 5 and 6). Figure 5. Flood frequency for the Santa Cruz River at Tucson, Arizona, 1914-1986, for El Niño and other years. (Modified from Cayan and Webb, 1992). Figure 6. Flood frequency for the Salt River near Roosevelt, Arizona, 1925-1988, for El Niño, La Niña, and other years. (Modified from Cayan and Webb, 1992). Accentuated ENSO effects on extreme hydrologic events over the western U.S. In a different, recent analysis of daily historical data, D. Cayan, K. Redmond, and L. Riddle (unpublished results) have discovered more about the relations between ENSO conditions and extreme daily precipitation and streamflow events over the western U.S. When ENSO creates warm tropical Pacific conditions, there is an increase in the frequency of days with high precipitation and streamflow during the cool season in the Southwest, including central California. Under these conditions, in contrast, the cool season in the Northwest is characterized by a decrease in the frequency of days with high precipitation and streamflow. The opposite pattern is recorded for conditions of cool tropical Pacific conditions. The effect on streamflow is greater than that on precipitation, and the streamflow signal persists beyond the active winter precipitation season. Such an amplification is probably related to the buildup of soil moisture during precipitation events and its contribution to later runoff. The success of this analysis suggests that general forecasts of the effects of El Niño on the Southwest can be made several months in advance, at least with respect to predictions of higher frequency of rainy days and greater streamflows than during La Niña or non-event years. Andrade, E.R., and Sellers, W.D., 1988, El Niño and its effect on precipitation in Arizona and western New Mexico: Journal of Climate, v. 8, p. 403-410. Carleton, A.M., Carpenter, D.A., and Weser, P.J., 1990, Mechanisms of interannual variability of the southwest United States summer rainfall maximum: Journal of Climate, v. 3, p. 999-1015. Cayan, D.R., and Peterson, D.H., 1989, The influence of North Pacific atmospheric circulation on streamflow in the west, in Peterson, D.H., (ed. ), Aspects of Climate Variability in the Pacific and the Western Americas: Geophysical Monograph 55, Washington, D.C., American Geophysical Union, p. 375-397. Dettinger, M.D., and Cayan, D.R., 1992, Climate-change scenarios for the Sierra-Nevada, California, based on winter atmospheric-circulation pattern, in Proceedings, managing water resources during global change: American Water Resources Association, Bethesda, MD, p. 681-690. Dettinger, M.D., Cayan, D.R., and McCabe, G.J., Jr., 1993, Decadal trends in runoff over the western United States and links to persistent North Pacific sea-surface-temperature and atmospheric-circulation patterns, in Proceedings of the 18th annual climate diagnostics workshop: U.S. Department of Commerce, Washington, D.C., p. 240-243. Diaz, H.F., 1991, Some characteristics of wet and dry regimes in the contiguous United States: Implications for climate change detection efforts, in Schlesinger, M.E., (ed. ), Greenhouse-Gas-induced Climatic Change: A Critical Appraisal of Simulations and Observations: Amsterdam, Elsevier, p. 269-296. Hereford, R., and Webb, R.H., 1992, Historic variation in warm-season rainfall on the Colorado Plateau, U.S.A.: Climatic Change, v. 22, p. 239-256. Hirschboeck, K.K., 1985, Hydroclimatology of flow events in the Gila River Basin, central and southern Arizona: Ph.D. dissertation, University of Arizona, 335 p.
Kahya, E., and Dracup, J.A., 1993, U.S. streamflow patterns in relation to the El Niño/Southern Oscillation: Water Resources Research, v. 29, p. 2491-2503. McCabe, G.J., Jr., 1995, Relations between winter atmospheric circulation and annual streamflow in the western Untied States: Climate Research, v. 5, p. 139-148. Redmond, K., and Koch, R., 1991, ENSO vs. surface climate variability in the western United States: Water Resources Research, v. 27, p. 2381-2399. Ropelewski, C.F., and Halpert, M.S., 1986, North American precipitation and temperature patterns associated with the El Niño/Southern Oscillation (ENSO): Monthly Weather Review, v. 114, p. 2352-2362. Schonher, T. and Nicholson, S.E., 1989, The relationship between California rainfall and ENSO events: Journal of Climate, v. 2, p. 1258-1269. 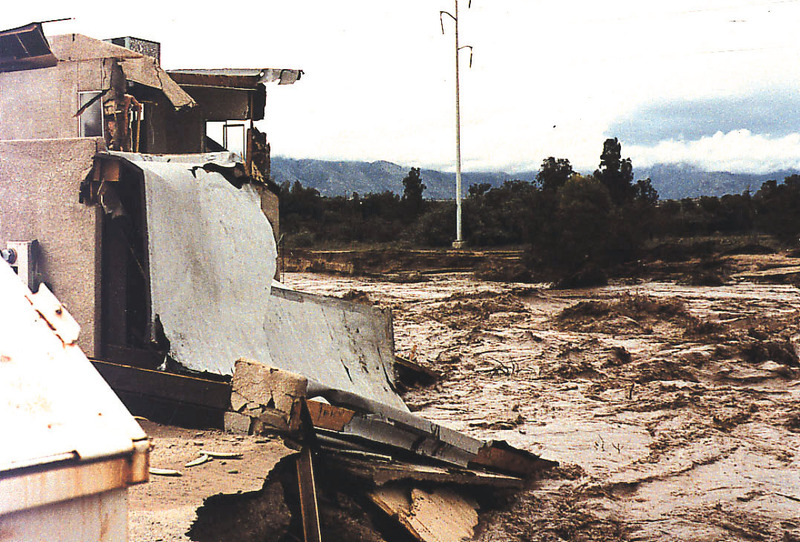 Smith, Wlater, 1986, The effects of eastern North Pacific tropical cyclones on the southwestern United States: Salt Lake City, Utah; NOAA Technical Memorandum, NWS WR-197, 229 p.
Webb, R.H., and Bettencourt, J.L., 1992, Climatic variability and flood frequency of the Santa Cruz River, Pima County, Arizona: U.S. Geological Survey Water-Supply Paper, 2379, 40 p.
Yarnal, B. and Diaz, H.F., 1986, Relationships between extremes of the Southern Oscillation and the winter climate of the Anglo-American Pacific Coast: Journal of Climate, v. 6, p. 197-219. Any long-term increase in precipitation and runoff in the arid southwest potentially can lead to rising water levels of terminal lakes, which have no outlet to the sea, and in which water leaves the lake only via evaporation. When evaporation cannot keep pace with precipitation and runoff, the lake level rises. Abstracted from Arnow, T., and Stephens, D., 1990, Hydrologic characteristics of the Great Salt Lake, Utah: 1847-1986: U.S. Geological Survey Water-supply Paper 2332, 32 p.
Ted Arnow is retired from the USGS. Doyle Stephens is a hydrologist with the USGS, Salt Lake City, UT. Figure 7. 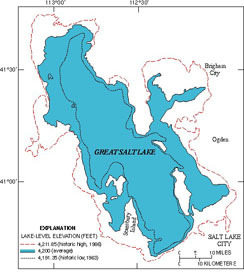 Area covered by Great Salt Lake at historic high, low, and average levels, 1847-1986. (Modified from Arnow and Stephens, 1990). The Great Salt Lake is the fourth largest terminal lake in the world. Its size varies considerably depending on lake level so that seemingly small changes in the elevation of the lake surface can lead to enormous changes in the amount of land surface lost when the lake level rises or exposed when lake level falls (Fig. 7). When the lake lies at its average level of 1,280 m (4,200 ft), it covers about 4,400 km2 (1,700 mi2) with maximum depth of about 10 m (34 ft). With the historic low level (1,277.5 m; 4,191.35 ft) in 1963, the lake covered only 2,460 km2 (950 mi2). In contrast, the historic high of 1,283.8 m (4,211.85 ft) in 1986 covered about 5,960 km2 (2,300 mi2); the previous high in 1873 was less than 20 cm lower. The historic record of water-level changes (Fig. 8) shows high-amplitude changes that span several years to several decades. For more information see "Precipitation Trends and Water Consumption in the Southwestern United States". Figure 8. 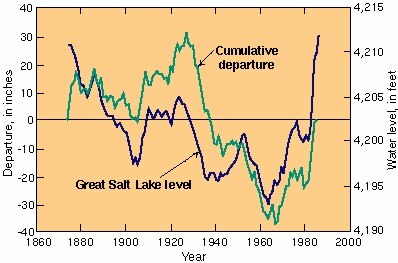 Annual peak water levels (blue line) of Great Salt Lake, 1875-1986. The cumulative departure from the average annual precipitation of 15.79 inches at Salt Lake City recording sites) over the same period is shown by the green line. (Modified from Arnow and Stephens, 1990). The inexorable lake-level rise of Great Salt Lake from 1982 to 1986 was at least partly related to the record rainfall and snowfall during the 1982-1983 El Niño. Questions remain, however, about the contribution of El Niño to rising water levels after 1983, when the El Niño waned. Another factor that might have contributed to the lake-level rise was the large volcanic eruption of El Chichón (Mexico) that introduced enormous volumes of sulfuric aerosols in the atmosphere. Such aerosols would decrease solar radiation and cause a decrease in evaporation or an increase in precipitation, or both. Some earlier episodes of lake-level rise appear associated in time with other major eruptions. Nevertheless, this example of lake-level change is instructive for the impacts of El Niño, as well as for any other climatic phenomenon that results in above normal precipitation and runoff, combined with low evaporation. The close link between precipitation alone and lake level is illustrated in Figure 8 comparing peak water levels of Great Salt Lake with the cumulative departure from the average precipitation. Another factor that controls lake level is society's consumptive use - the diversion of fresh water for irrigation, public supply, and impoundment in reservoirs where it evaporates. Without these diversions, the lake would have been about 0.8 m (2.5 ft) higher in 1986. Figure 9. The Bear River Migratory Bird Refuge first flooded in 1983 and was still underwater when this photograph was taken by Doyle Stephens on June 19, 1986. Figure 10. 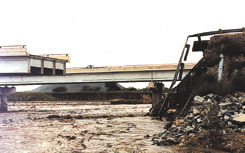 Air photograph (view to northeast) shows damage to the Southern Pacific Transportation Company causeway near Lakeside from a storm on June 8, 1986. Photograph taken on June 19, 1986, by Doyle Stephens. The rise in Great Salt Lake in the early to mid 1980s resulted in costly damage to many sectors of society, along with the disruption of local and interstate transportation. The lake level rose 3.7 m (12.2 ft) in only four years, from 1982 to 1986, causing about $285 million in damage to lakeside industries, transportation, farming, and wildlife habitat by the inundation of freshwater marshes (Fig. 9). Accompanying dilution to the lowest known level of salinity hurt certain salt and metal extraction industries and changed the biota of lake by reducing populations of brine shrimp and green brine algae while increasing those of blue-green algae and brackish water fish. Transportation facilities and infrastructure were especially hard hit (Fig. 10). Interstate 80 was intermittently flooded and the roadbed was raised. The Union Pacific Railroad elevated its routes across the lake three times to keep the tracks above water. The international airport escaped inundation by 2.4 m (8 ft). Although not the focus of this discussion about El Niño, we might consider the disruption and costs that may accompany low lake-level conditions at the other end of the climatic spectrum. Lack of freshwater replenishment of wildlife marshes and the likelihood of increased saline dust storms are among the expected consequences of drought. Extreme examples of the effects of lowering the levels of terminal lakes in arid regions can be found in conditions around the Aral Sea of Uzbekistan and Kazakhstan. In the Aral Sea, the main cause of lowered lake level is the diversion of two rivers for agricultural irrigation. Satellite images of Great Salt Lake; discussion; more references. Arnow, Ted, 1984, Water-level and water-quality changes in Great Salt Lake, Utah, 1847-1983: U.S. Geological Survey Circular 913, 22 p.
Gore, R., 1985, No Way to Run a Desert--The Rising Great Salt Lake: National Geographic Magazine: v. 167, no. 6 (June), p. 694-719. Gwynn, J.W., ed., 1980, Great Salt Lake, A scientific, historical, and economic overview: Utah Geological and Mineral Survey Bulletin 116, 400 p.
Stephens, D.W., 1974, A summary of biological investigations concerning the Great Salt Lake, Utah (1861-1973): Great Basin Naturalist, v. 34, p. 221-229. 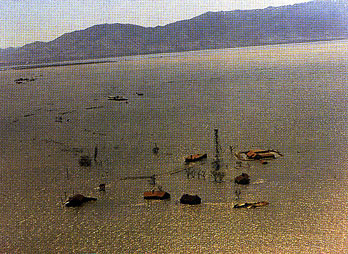 Utah Division of Water Resources, 1984, Great Salt Lake, Summary of technical investigations for water level control alternatives: Salt Lake City, Utah Division of Water Resources, 100 p.
Intense rainfall is one of several mechanisms that trigger landslides and debris flows; others include earthquake shaking and volcanic eruption. Shallow landslides are generated during storms, because infiltrating rainwater saturates the soil and raises pore-water pressure. As with floods, heavy precipitation may lead to landslides in the Southwest regardless of El Niño timing. Nevertheless, some of the most destructive landslides in this region over the past few decades have occurred during El Niño events. Many studies (summarized by Wieczorek, 1996) demonstrate the threshold effect of combined intensity and duration of rainfall for unleashing landslides. In one example, Cannon and Ellen (1985) identified thresholds of combined rainfall and duration that triggered thousands of landslides during a 32-hour rainstorm in the San Francisco Bay area in January, 1982 (Fig. 11). Such thresholds vary from place to place because of different conditions of bedrock, soil, slope, and climate. Figure 11. Rainfall thresholds that triggered abundant landslides in the San Francisco Bay region, California. Thresholds for high and low mean annual precipitation (MAP) areas are indicated as curves that represent the combination of rainfall intensity and duration. Modified from Wieczorek (1996) and Cannon and Ellen (1985). An especially effective recipe for debris flows is intense rainfall over areas in which vegetative cover has been destroyed by wildfire (studies summarized by Wieczorek, 1996). Such fires not only expose loose soil but may also produce a water-repellent (hydrophobic) soil layer that together promote erosion and transport of sediment as debris flows. This pattern, termed the "fire-flood sequence", has triggered a number of disastrous debris flows in southern California when large summer or autumn brush fires were followed by heavy winter storms with loss of life and severe property damage. 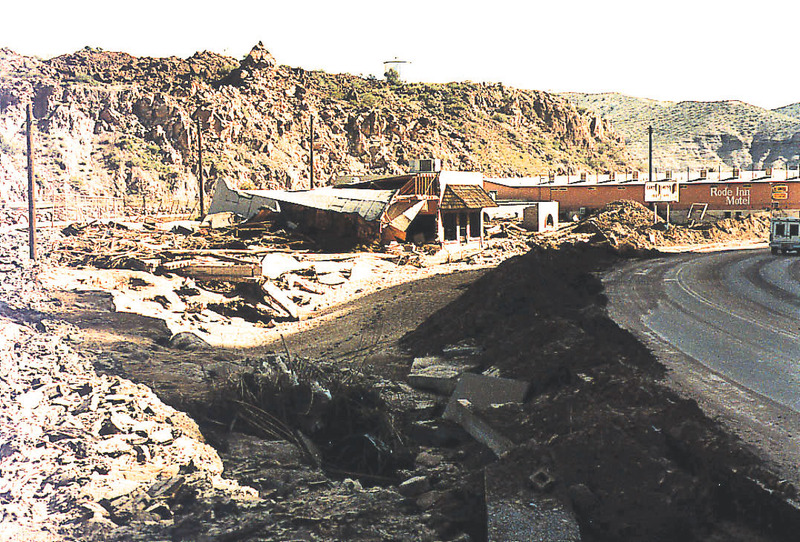 An example (although not related to El Niño) is the debris flow of February 9, 1978, on Mill Creek that swept away the mountain village of Hidden Springs, killing 13 people. The debris flow resulted from a cloudburst in an area that had burned the previous summer. Figure 12. The 1983 Thistle, Utah, landslide buried parts of two State highways and tracks of the Denver and Rio Grande railroad. Air photograph provided by the USGS National Landslide Information Center. Click on image for larger version. Unusually heavy precipitation in central Utah during late 1982 to Spring, 1983, saturated slopes in the Wasatch Range and nearby mountain ranges triggering numerous landslides and debris flows. The largest and most destructive of these was active for a two-week period in April, 1983, near the town of Thistle, about 90 km (56 miles) south-southeast of Salt Lake City. 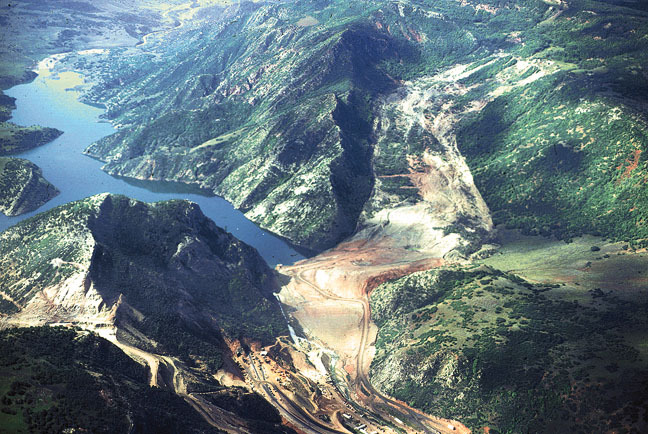 Beginning as rejuvenated movement on an old landslide, the Thistle landslide incorporated about four million cubic meters of rock and mud to fill part of Spanish Fork Canyon, blocking two creeks (Fig. 12). The resulting lake, nearly 5 km long and 60 m deep, inundated Thistle, three major highways, and an important route of the Denver & Rio Grande Western Railway, and it posed a flooding hazard to downstream communities. The threat was eliminated only after the lake was drained by tunneling through one of the canyon walls. Combined direct and indirect costs from the Thistle landslide exceeded about $400 million, making it the most expensive single landslide in U.S. history. Cannon, S.H., and Ellen, S.D., 1985, Rainfall conditions for abundant debris avalanches, San Francisco Bay region, California: California Geology, v. 38, p. 267-272. 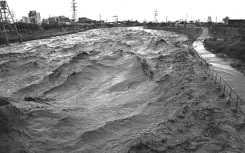 Ellen, S.D., and Wieczorek, G.F., eds., 1988, Landslides, floods, and marine effects of the storm of January 3-5, 1982, in the San Francisco Bay region, California: U.S. Geological Survey Professional Paper 1434. Wells, W.G. II, 1987, The effects of fire on the generation of debris flows in southern California, in Costa, J.E., and Wieczorek, G.F., eds., Debris Flows/avalanches: Process, recognition, and mitigation: Reviews in Engineering Geology, v. 7, Geological Society of America, Boulder, Colo., p. 105-114. Wieczorek, G.F., 1996, Landslide triggering mechanisms, in Turner, A.K., and Schuster, R.L., eds., Landslides: investigation and mitigation: Special Report 247; Transportation Research Board, National Research Council, p. 76-90. Wieczorek, G.F., Lips, E.W., and Ellen, S.D., 1989, Debris flows and hyperconcentrated floods along the Wasatch Front, Utah, 1983 and 1984: Bulletin of the Association of Engineering Geologists, v. 26, p. 191-208.